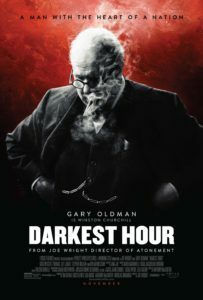 Stars Gary Oldman as Winston Churchill in an Oscar-winning performance. The story takes place during a four-week time-span in 1940 focusing on Churchill’s courage to fight Nazi Germany in spite of his doubters. Kristin Scott Thomas stars as Churchill’s loving, supportive wife Clemmie, Lily James as his hesitant, loyal secretary Elizabeth Layton and Ben Mendelsohn as King George VI, a skeptic who came to his aid. The film begins with Churchill’s first weeks in office in London’s Parliament during the early days of the WWII. His unconventional, yet brilliant diplomacies brought him at the unlikely age of 65 years old, as a candidate for Prime Minister. With allied nations continuing to fall against Nazi Germany troops, and with the most of the British army stranded in France—Dunkirk is a companion piece to the film. A tough leader is direly needed. He takes office on May 10th, 1940 to find his own party plotting against him along with King George VI. Most are skeptical that he will be able to combat the Nazi’s. The centerpiece of the film is whether Churchill will negotiate a peace treaty with Nazi Germany or fight against inconceivable odds. Looking to the British people for guidance Churchill decides to stand strong and fight for his nation’s ideals, liberty, and freedom. He realizes the only way to win over the nation is to deliver speeches that are so powerful and convincing England will rally and ultimately win. The Bottom-Line: Oldman’s performance is mesmerizing to watch, his emotional depth is uncanny, especially when he states, “When will they realize that you can not negotiate with a tiger when your head is in its mouth?” Shades of Daniel Day Lewis’s enactment in Lincoln yep Oldman has nailed the performance. His performance is worth the price of admission as well as the epic directing by Joe Wright and the supporting performances by the entire cast. Excellent film! Director: Joe Wright (“Atonement,” “Hanna,” “Pride & Prejudice,” “Anna Karenina”)Writer: Anthony McCarten (“The Theory of Everything”) Prosthetics, Make-up and Hair Designer for Gary Oldman, Kazuhiro Tsuji.